Summer in Indianapolis is long but never boring. There are plenty of activities planned all around the city to keep you entertained. Even when summer starts to roll to close, Indianapolis continues with a great lineup of shows and performances right into early fall. Here are a few shows you won’t want to miss in 2018. For a fun kids event, make sure to take your little ones to Kidz Bop Live 2018. Kidz Bop albums are compilations of songs “sung by kids for kids.” Kidz Bop records kid-friendly versions of today’s most popular songs. The Kidz Bop kids perform around 50 live shows a year. Indianapolis children will get to experience the fun lively show on June 23. The 2018 tour coincides with the release of their latest album “Kidz Bop 37.” The show takes place at Farm Bureau Insurance Lawn at White River State Park from 6-8 p.m. Tickets cost between $20 and $50. Two of the most successful rock bands that hail from the Midwest are coming together for a North American tour this summer. Chicago and REO Speedwagon are co-headlining a tour that will kick off on June 13 in Concord, California. They’ll be performing in Indianapolis on Aug. 11 at the Ruoff Home Mortgage Music Center. The show starts at 7:30 p.m. and tickets range from $21 to $128.50. For serious fans, there are premium and VIP packages for $274 and a meet and greet package for $374. For those who enjoy unconventional theater, the Indy Fringe Festival will be right up your alley. Fringe festivals are known for their cutting-edge, eclectic, and sometimes controversial content. Taking place over 11 days from Aug. 16 to 26, the Indy Fringe Festival covers a wide range of genres including comedy, drama, dance, cabaret, music and musicals, and multimedia. Around 80 groups and nearly 400 individuals will perform at multiple venues on or near Massachusetts Avenue in the arts and theater district of downtown Indianapolis. The popular Cirque du Soleil has been delighting audience members since it started in 2005 in Montreal, Canada. This year, Indianapolis will host Cirque du Soleil’s Corteo production from Aug. 22-26. Corteo is an exuberant celebration of the life of clown Mauro with memories, laughter, and a festive parade filled with joyous merrymaking. Don’t miss the extravaganza at Bankers Life Fieldhouse. Tickets start from $39. 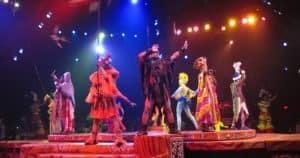 If you still haven’t seen the long-running and award-winning musical “The Lion King,” then catch the show in Indianapolis in September. This spectacular stage production is a visual and auditory feast with stunning costumes and a masterful musical score. Based on the Disney animated movie, the 2018 theater production will continue thrilling audiences. You can see the show at the Murat Theater at Old National Center. It runs from Sept. 12-29 with tickets ranging from $38 to $106. Whether you call Indianapolis home or you’re just visiting, catch these great shows and much more in Indy this summer through to fall.